Mommy, Esq. : What's Cooking? Only 6 more days until they are out of the oven! What's Cooking? Only 6 more days until they are out of the oven! Today was my last doctor's appointment - and I didn't really have to wait very much. I sat right next to a woman in the waiting room because I needed to share the footstool (my feetloaves are a sight let me tell you). She sympathized and when I found out she was 34 weeks I asked if she was having twins because she looked about my size. Terrible of me, I know - but I was right. She also has Dr. Whatscooking and said she doesn't care about the wait because he is supposed to be so great. She is a cardiologist at the the Hospital and says he is highly recommended. I mentioned some stuff I didn't like (waiting, lack of bedside manner, no voluntary questions/information on his part) and she agreed that he does expect his patients to be pro-active and "know" what to ask. In any event I had already heard that he does a nice C-Section so I stuck with him for next Monday at 1:30 pm (there was an 8:30 am slot with his colleague but I turned it down). With respect to the no eating/drinking it is an 8 hour rule so I can count back from 1:30 pm. Ultrasound was uneventful - no measurements but general "biophysical" check looked fine - blood flow for Baby A is within normal. I don't have Group B Streptococous so no worries about infection if my "bag of waters" breaks. Finally, I'm done with GD - no need to continue recording but I'll still "try" to be good - but maybe sneak in some ice cream. My hospital bag is mostly packed but I'm hoping the babies hold off until Monday - give them a little more time to grow and another weekend for Husband and me to complete chores. I'm still deciding how nervous I am about the surgery. One one hand it is done all the time, on the other hand it is surgery and I could die. It didn't help that I was watching Tori and Dean yesterday and she was crying and freaking out about her second C-Section. Right now I'm just trying to focus on the probable positive outcomes of two healthy babies and one healthy mom. Wohoo, the end is SO in sight! Exciting! I've had two c-sections - the second I was terrified (for no reason since my first was fine). Well, the section was wonderful - the best birth experience I could have asked for. Just lovely. Hope you have the same! I'm sure it's normal to be scared. Can't really imagine how you wouldn't be. This is a BIG deal! But you'll have Husband with you and what sounds like a great doctor and everyone looking out for you. You're going to be great and at the end there will be this new little girl and boy to love. Big kisses. Wish I could be there with you! I am excited for you! 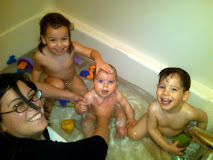 What a cool thing it is to suddenly see the two little people you have been caring for all these months!